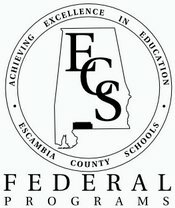 The office of Federal Programs is responsible for the administration of all funds and services provided to the Escambia County School System by the Federal Government. This includes the expenditure, distribution, and monitoring of Title I, Title II, and Title V funds, as well as services for English Learners (EL) and homeless/migrant students. We monitor 21st Century programs, and communicate with parents to ensure Parent and Family Engagement in all of our schools. Federal Programs staff are also charged with monitoring schools' compliance with Alabama's state requirements.